This is just the second year I've grown hops in earnest. I'm always amazed at how quickly hop plants grow in the heat of summer! 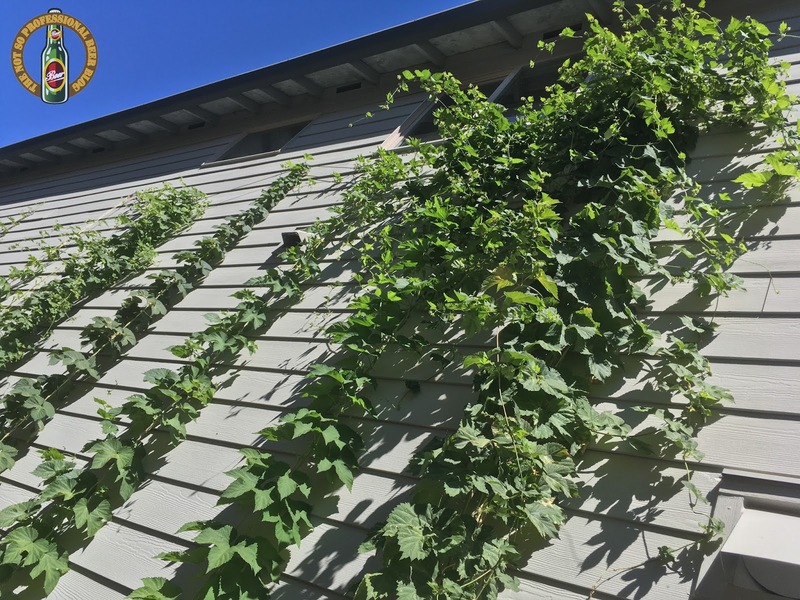 Below is a shot from The Not So Professional Hop Estate. Compare this with a picture from just one month ago (listed at the bottom of my June update). They've grown a lot! 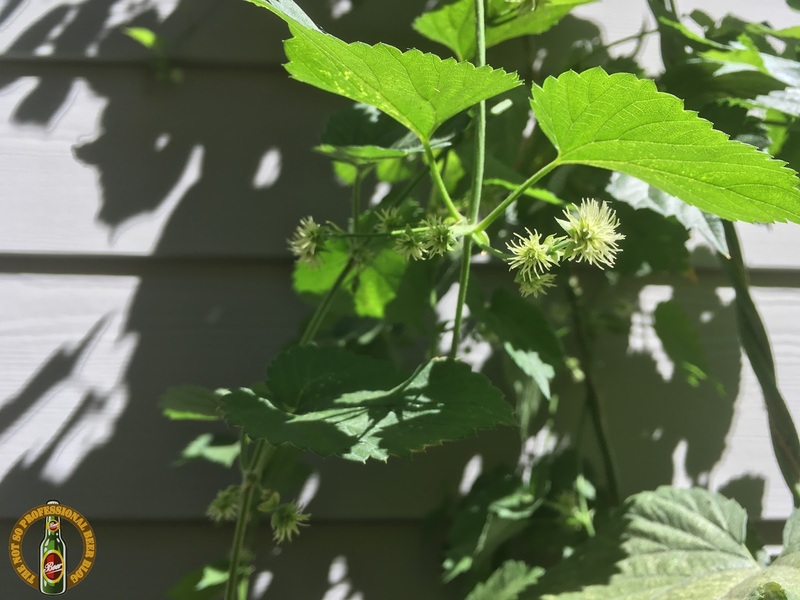 Hop burrs are forming! This is important because burrs turn into hop cones. I expect to see many cones in development next month. 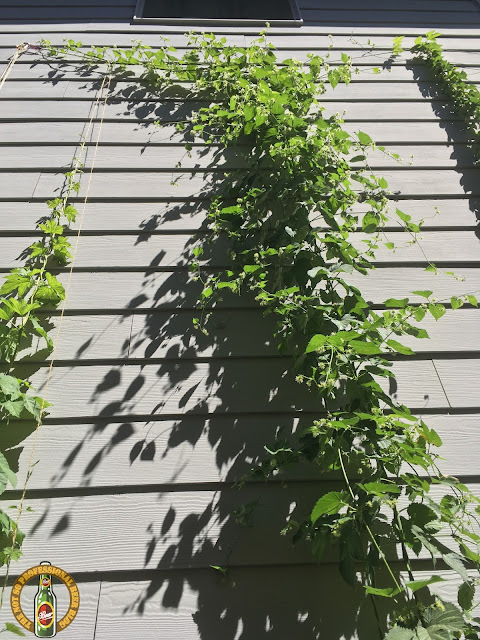 My 2nd year Centennial and 3rd year Willamette have no burrs and have been surpassed in height by four of my first year plants. Three of my first years have formed burrs. I believe the reason for the underperformance of my older plants is the lack of self-produced nutrition. I discussed this in last month's update. My theory is bolstered by the fact that my 2nd year Chinook (which benefitted from extra nutrition) is looking great, and has the most burrs. It's growing like crazy and has attached itself to its neighbor! 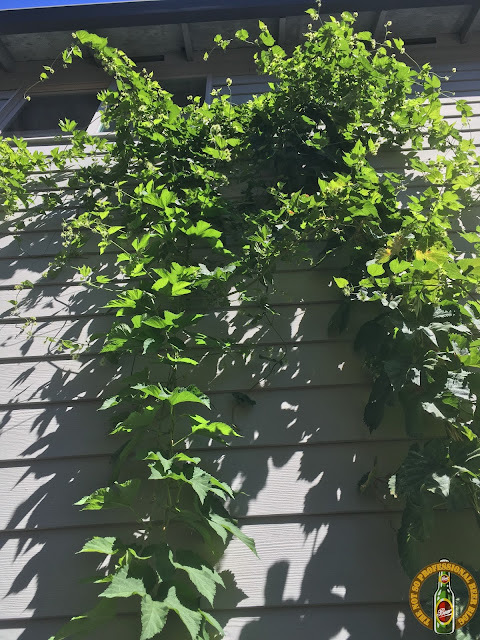 My 1st year Cascade (planted from a rhizome this spring) is my 2nd tallest plant and also has plenty of burrs. 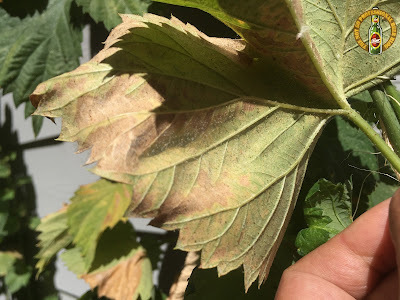 I've got some sort of leaf rot on a few of the plants. If you look closely in the picture below, you'll see a white fuzz. 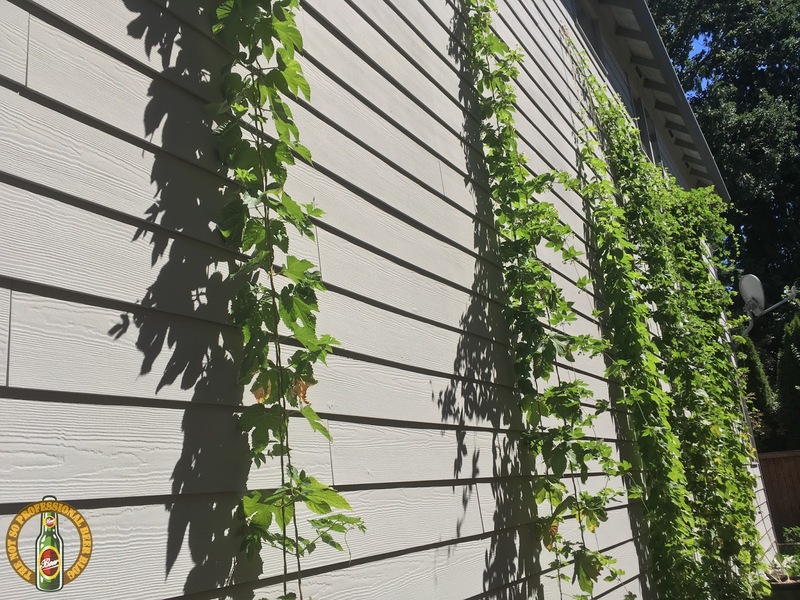 It's limited to the lower regions of the plant, and does not appear to be harming the top leaves where the hops are growing. I just pull these leaves off. I can't wait to see how things will look in a month. Check back soon! Today, Public Coast Brewing is launching The People's Pale in honor of the 50th Anniversary of the Oregon Beach Bill. 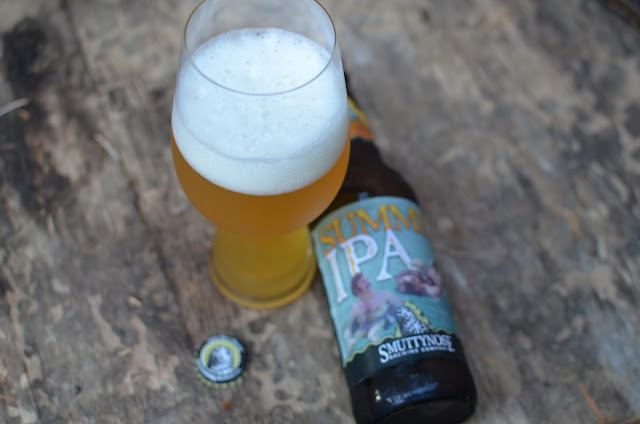 This 5.7% ABV pale ale features five hops (El Dorado, Horizon, Crystal, Cashmere, and Columbus). The brewery sent me a preview crowler, which I shared with friends over the holiday weekend. 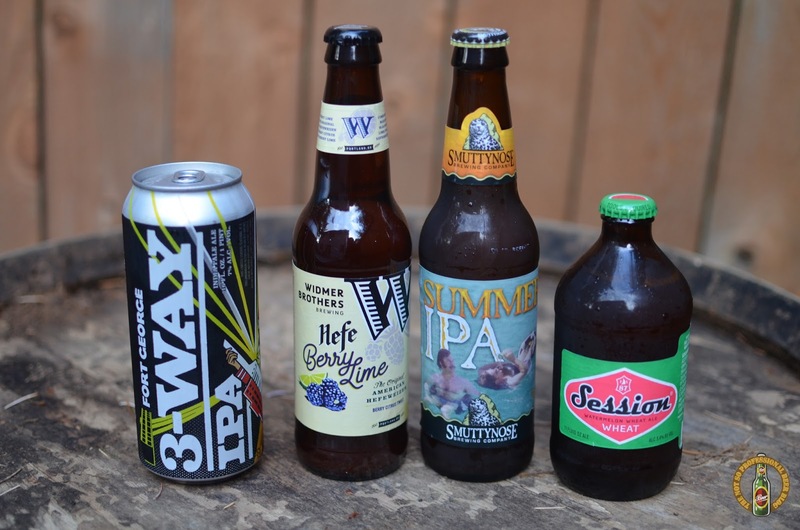 From my tasting, the quintet of hops delivered a delicious blend of tropical, floral, and spicy flavors. The People's Pale will be available starting today at the brewery followed by broader distribution later this summer. For more details about Public Coast Brewing Co. and The People's Pale, check out the news release below. 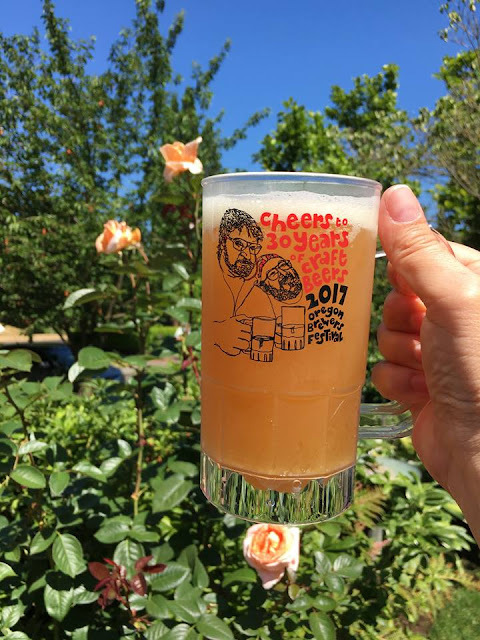 CANNON BEACH, Ore.- Public Coast Brewing, named after Oregon’s 363 miles of free and open coastline, introduces The People’s Pale, brewed in celebration of Public Coast Brewing’s first birthday and in homage to the Oregon Beach Bill, which celebrates the 50th anniversary of its signing on July 6. This American pale ale will be unveiled and celebrated on July 6 at Public Coast Brewing with live music, complimentary beer samples and more. The People’s Pale is crafted with grain and hops grown in Oregon and malted in Baker City. 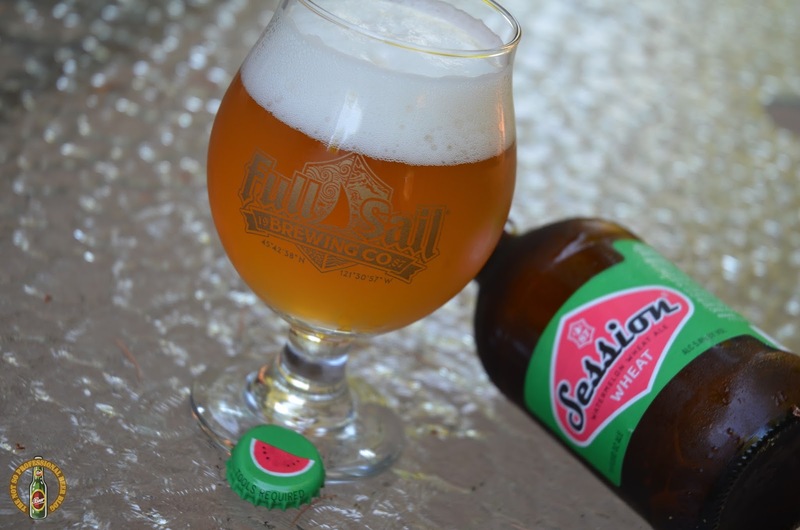 It boasts a bounty of flavors, including citrus and bitters, making this a true pale ale for the people. 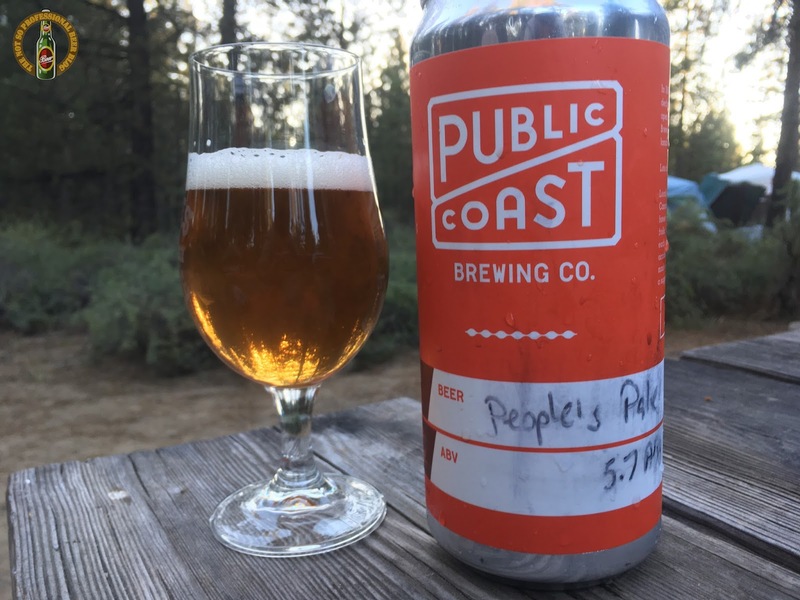 The People’s Pale is currently available at Public Coast’s brewery in Cannon Beach (264 E 3rd St, Cannon Beach, OR 97110), and will be distributed more broadly this summer and fall. Public Coast features food and perfectly paired beverages to accompany a day filled with beachcombing, hiking, Haystack Rock gazing and kite flying. 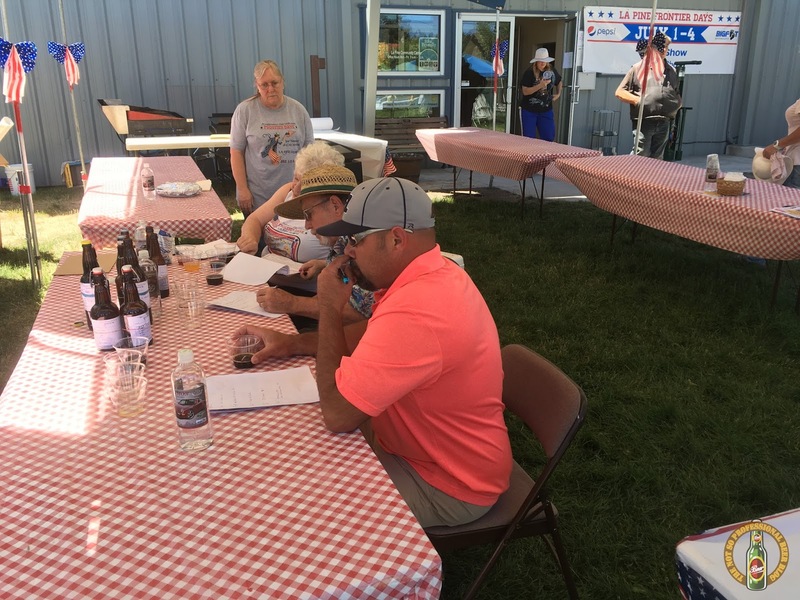 The Brewery uses only seasonal, local and fresh ingredients, including Oregon grass-fed beef, fresh-catch fish and house-made brats with tangy sauces, not to mention, Jacobsen Salt Caramel Sundaes. Public Coast even brews a housemade root beer - Stephen’s Root Beer - named for and brewed with the founder’s 15 year old son. 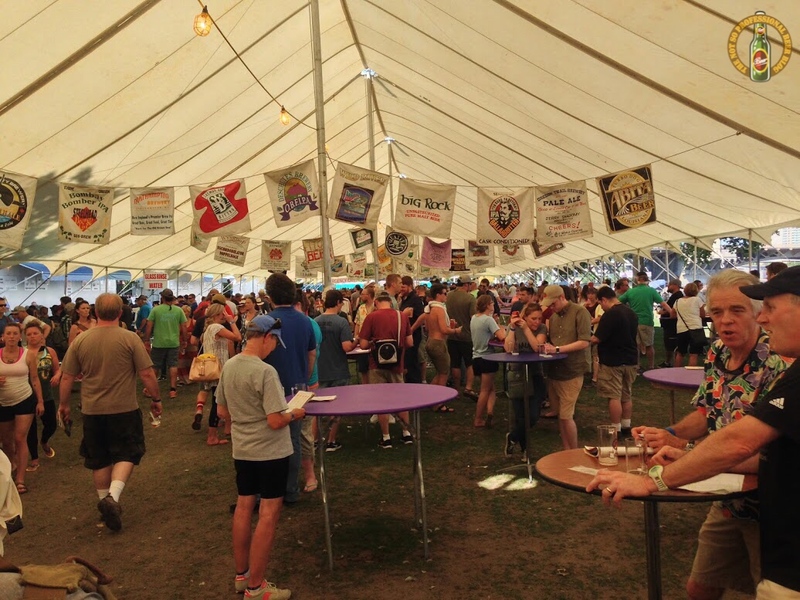 For a full list of beers on tap visit, http://publiccoastbrewing.com/beer/. Located just 70 miles west of Portland in Cannon Beach, Ore., Public Coast Brewing is named after the only true public coastlines in America - the Oregon coast. The brewery features a 10bbl brewhouse with one 20-barrel fermenter and two 10-barrel fermenters. Public Coast Brewing also offers fresh and delicious food from local farms and ranches for adults and children alike. Boasting a large pet-friendly patio, wrap-around bar, shuffle board and tall windows for peering into the brewery, Public Coast Brewing offers a relaxed and welcoming spot for the whole family. For more information please visit, http://publiccoastbrewing.com/. 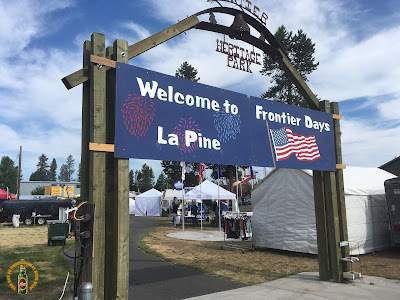 I spent the 4th of July weekend camping at La Pine State Park (27 miles SW of Bend) with several families. Although we were relatively close to Bend, we only ventured into the big city once to go float tubing on the Deschutes (highly recommended for all ages). Instead, we spent most of our time at the park. I brought two cases of homebrew and few other favorite beers to keep my friends properly hydrated over the weekend. We also ventured into La Pine for Frontier Days, a four day 4th of July Celebration. In addition to events like Lawnmower Races, Apple Pie Contest, and Woodcutters Jamboree, they also hosted a Homebrew Contest. 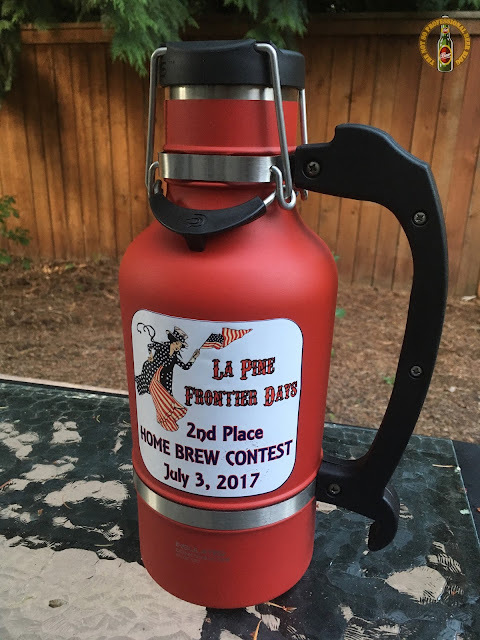 In the six or so years I've been homebrewing, I've only entered one contest. So I decided to enter two of my recent favorite creations into the Frontier Days Hombrew contest. My first entry was a Session Stout with Cacao Nibs (a.k.a. #33). I number my beers, and this was the 33rd beer I brewed. I also entered my Jalapeño Apricot Cider. 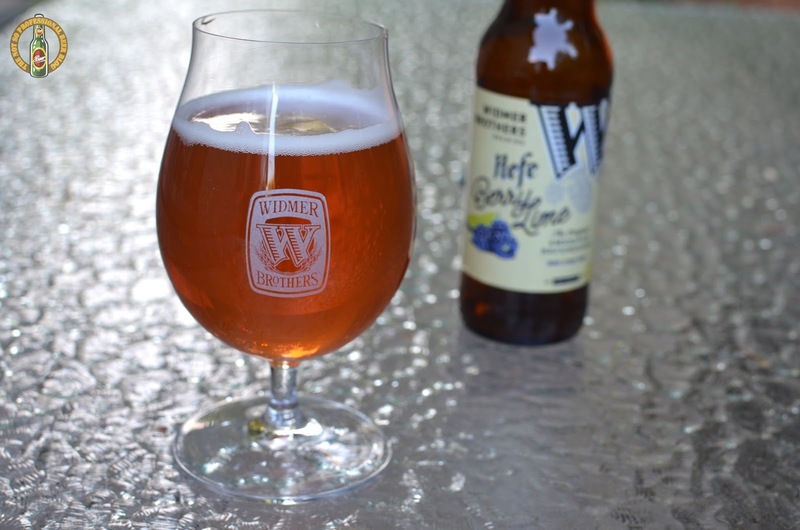 I'm a fairly harsh critic of all my creations, but I was particularly proud of this beer and cider because they're well balanced, and pretty darn tasty. I'll post the recipes and brew logs for both in the near future. 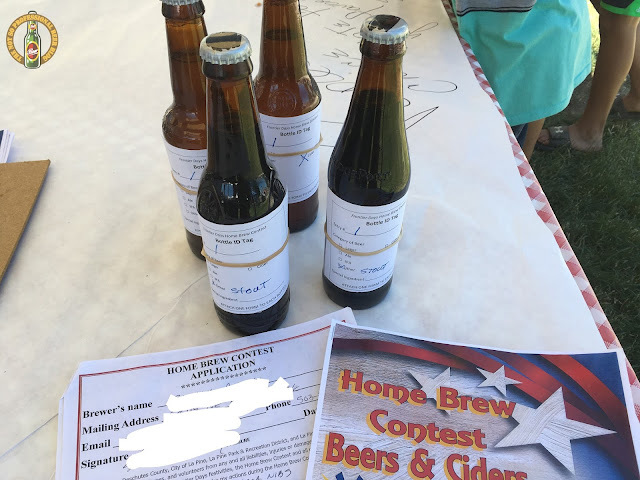 Long story short, my Session Stout won 2nd Place in the contest. My prize was a sweet 64 oz growler made right in Bend by DrinkTanks!